Dietrich, M., M. A. Tjale, J. Weyer, T. Kearney, E. C. J. Seamark, L. H. Nel, A. Monadjem and W. Markotter. 2016. Diversity of Bartonella and Rickettsia spp. 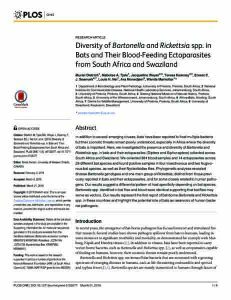 in bats and their blood-feeding ectoparasites from South Africa and Swaziland. PLoS ONE. 11(3): e0152077. doi: 10.1371/journal.pone.0152077. In addition to several emerging viruses, bats have been reported to host multiple bacteria but their zoonotic threats remain poorly understood, especially in Africa where the diversity of bats is important. Here, we investigated the presence and diversity of Bartonella and Rickettsia spp. in bats and their ectoparasites (Diptera and Siphonaptera) collected across South Africa and Swaziland. We collected 384 blood samples and 14 ectoparasites across 29 different bat species and found positive samples in four insectivorous and two frugivorous bat species, as well as their Nycteribiidae flies. Phylogenetic analyses revealed diverse Bartonella genotypes and one main group of Rickettsia, distinct from those previously reported in bats and their ectoparasites, and for some closely related to human pathogens. Our results suggest a differential pattern of host specificity depending on bat species. Bartonella spp. identified in bat flies and blood were identical supporting that bat flies may serve as vectors. Our results represent the first report of bat-borne Bartonella and Rickettsia spp. in these countries and highlight the potential role of bats as reservoirs of human bacterial pathogens.